Home Uncategorized You’re Invited to the Newhall Pass Open Space Dedication Ceremony! The City of Santa Clarita and The Trust for Public Land are hosting a ribbon cutting event on Thursday, June 15 at 9:00 a.m. to celebrate the City’s acquisition and protection of open space in the Newhall Pass. 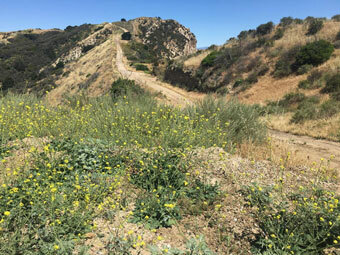 The event celebrates the recent acquisition of 240 additional acres in the Newhall Pass, connecting to Gateway Ranch, a 302-acre property located on the northern half of the former Las Lomas development. Once planned for a major housing development, the land is now part of the City’s Open Space Preservation District and protected from development indefinitely! To attend, please RSVP by June 12 to Jannelle Gonzales with The Trust for Public Land at jannelle.gonzales@tpl.org or (323) 223-0441, extension 10. Please park at the Newhall Church of the Nazarene, located at 23857 The Old Road, to board a free shuttle to the event. The last shuttle will depart church parking lot for dedication site at 9:15 a.m. Those planning on staying for the hike are asked to park in the designated lot off The Old Road at Edison Road. *The two hour hike will be moderate to difficult – hikers should dress accordingly and plan on hiking back to the designated lot.